The Trevor Von Eeden interview I conducted is finally out! It’s in The Comics Journal #298 and like the cover states, it’s a brutally honest take on Von Eeden’s early years, working at Marvel Comics, the demise of Thriller, his relations with Lynn Varley & Frank Miller, industry politics, racism, lawsuits, and much more. An excerpt can be seen at The Comics Journal site. 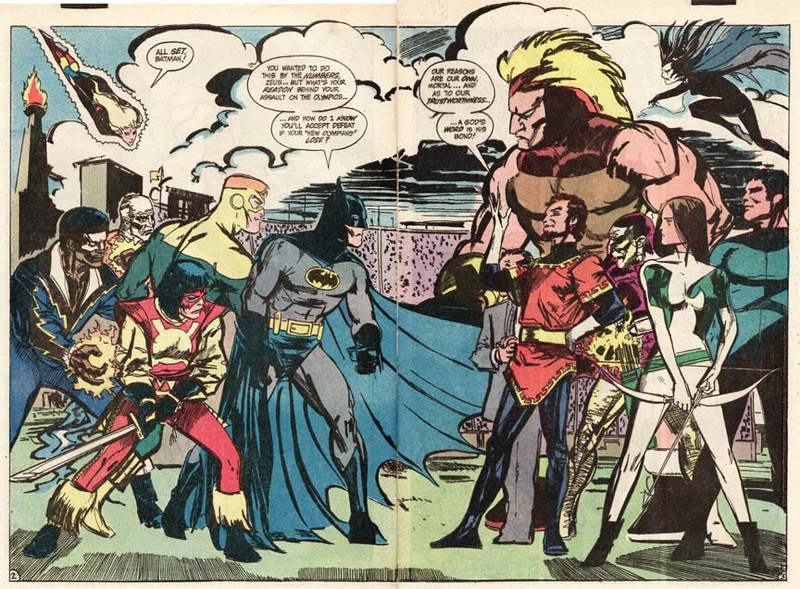 Batman & the Outsiders #14, written by mike W. Barr, November, 1984. Behind the cut there are a few interview responses that were edited out from the final piece, a slew of artwork that complements the interview, and creator quotes by Mark Waid, David Mazzucchelli, Tony Isabella, and Erik Larsen. Major thanks to Johnny Bacardi aka jbacardi for his help in connecting me with Von Eeden and for his fantastic Thriller articles. You know what I love about his art? It’s so efficient. I’m glad you posted this, because otherwise, I was going to have to send you a private LJ message or something. Started reading it yesterday when we got TCJ in with the shipment, and just finished it a few minutes ago. Absolutely fascinating. At the risk of indulging into voyeuristic gossipy territory, I’d love to hear the other people’s sides of the stories, like Alan Gold and particularly Lynn Varley. Holy hell, I had NO idea she was with Von Eeden! Much less that he lost her virginity to her, wow, what a story that whole arc was. And considering how much I love Helfer’s writing, man, I’d LOVE to have seen that ICE-T comic. Reading this, and then looking back on that amazing OUTSIDERS image above, I’m reminded what it is about his artwork today. I may be wrong, but it seems to me that he’s taken a bit of Neal Adams’ style into his own (that’s my guess, considering the tenure he went having to imitate his style). I admit, I miss the raw, angular nature of his work above and in THRILLER, as he he was blowing it all on the page so fast he barely had time to finish, for his brain to keep up with his hand. His work then (and now I’m thinking of that BATMAN ANNUAL) had a delicately kinetic life, and the closest artist I could possibly come up with to describe this unique style is Bill Sienkiewicz. We haven’t seen a talent like that before or since, and Eeden’s work in things like JOKER’S APPRENTICE… it’s filled-in (for lack of a better word), but also more grotesque. That said, I very much look forward to THE ORIGINAL JOHNSON, if it ever comes out. I always love to see an artist let loose, pouring their heart and soul onto the page, for better or for worse. Another great description: “delicately kinetic knife”. Totally sums up his early work. You’re right, too, about the Neal Adams influence being stronger in the latter days of his career. I think it’s due to the COntinuity days (like you said) and an automatic “go-to” when just working on assignments where he probably didn’t feel challenged by the scripts he was getting. Thanks for the kind words on the interview! Shipment?? What comic shop do you work at? I especially see the Adams influence on that one finished page of JOHNSON. It looks great, and yet, I do wish he could scale back to his original influence of Toth, y’know? Over the past ten years, ever since I was in high school, I’ve been an on-again, off-again employer for Big Planet Comics. Usually our Bethesda location, but for several years I was the assistant manager of our Georgetown store. You have have heard of BP, as the owners are pretty majorly involved in SPX. The Bethesda store has hosted the official SPX pre-show party for several years now! These days, I just fill in whenever I’m in town and they need me. And fortunately for me, yesterday was one of those days! In essence, my payment for a couple hours to help with the shipment was the GREEN LANTERN: RAGE OF THE RED LANTERNS hardcover and THE COMICS JOURNAL # 298. How often do you write for TCJ? I read that interview a couple of days ago but had no idea that you had written it! Good stuff, I’d never seen Von Eeden’s work before. It’s my first time writing for the Journal. I don’t make a habit of it; the Von Eeden piece was a personal thing that blew out of proportion, not really knowing where it was gonna end up being blogged or published. I showed it to the Journal and they liked it enough to run it. I would have to really like an artist to invest so much time into them. Having said that, I’m planning a sort of something having to do with interviews maybe… I’ll keep you posted! I was visiting Georgetown from New York a few months ago and went to the store there! I think it was on Avenue O or P or something. Anyway, good store! Cool! I wonder how his stuff looks to fresh eyes. Funny, I was just about to read your latest comic! That’s awesome. I love that it’s borne out of personal passion. I’ll definitely continue keeping an eye here for updates. I haven’t worked there in over a year, but I still feel like I should say thanks! We’ve always tried to keep our focus on trades, make it like a real bookstore. To this day, I get a little snobby whenever I go to comic stores and see them littered with collectibles and toys and games while the actual comics are ill-stocked. I bought that Von Eeden Batman Annual at a comic store whose entire trade stock was consigned to a single three-foot-long shelf. That was it. Kills me inside, I tells ya.